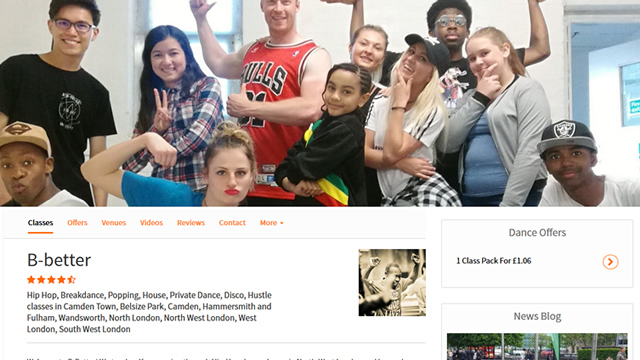 on the UK' s No1 Dance Class marketing and booking system. Dance Near You is the best way to market your business and bookings. "Dance Near You is amazing. It's easily my most consistent provider of new students and the booking system is brilliant. It's working and I really appreciate it, you guys are killing it. It's the best form of marketing service that I've ever used. Get noticed today, people. You need an account with them!" "This is the first time I've used an online booking system and so far I am very impressed. It's nice and streamlined and we have found it very easy to use and set up. Our customers have found it just as easy to book themselves a place at our events and us being able to have all their contact details has been beneficial. It's saved us lots of time doing administration and I would recommend it to other dance teachers." "Love dance NearYou produces a stream of online bookings for our London venues. Flexible easy to use with amazing support." "A very simple process of buying tickets for exercise classes near me. Had never used anything like this before and saves having to locate cash on the day of the class. It was very easy to locate all the different classes available and there were quite a few venues I could choose from." "Brilliant service was really quick and easy to use." "Fantastic class.. easy booking and clear directions. Informative class description"
The unbeatable way to promote your Dance business online. It's the best way to market your business online and get noticed. * NearYouPay needs to be activated to receive these features. It's free - no set up charges. An unbeatable marketing and booking platform – all this for less than a coffee a day! Transactions Reconciliation reports - see when you have been paid. Service Fee 6% service charged to customer – non refundable.